HA note: The author’s name has been changed to ensure anonymity. “Gemma” is a pseudonym specifically chosen by the author. My senior year was a year of crisis for the school. So much has been written about the academic freedom scandal of 2006 that it doesn’t seem necessary to rehash the whole story. The only points I want to make are 1) that the scandal didn’t come out of thin air—it had been building for years as the tension between the academic and cultural/religious sides of the campus became increasingly untenable—and 2) that it took a severe toll, emotional, psychological, spiritual, and physical, on the students as well. The troubles started during freshman orientation. Farris gave a speech during the orientation in which he claimed that Patrick Henry students only studied materials other than the Bible for purposes of “opposition research.” According to his interpretation of the doctrine of sola scripture, all necessary truth comes from the Bible. Everything else was just “learning the enemy’s playbook.” Even Plato and Aristotle could not teach us anything worthwhile. We were only to study them to become knowledgeable about “the world.” This was and still is a laughably simplistic viewpoint for any Christian, much less the president of an institution of higher learning, to hold. The faculty, including the feared and respected Academic Dean, publicly disagreed with this position, which embarrassed and enraged Farris. A few weeks later came the first of what is now an annual event at PHC: the Faith & Reason lecture. It was given by Todd Bates, our unassuming theology professor. He used some writings by St. Augustine to form the basis of his argument for why Christians should study the liberal arts. On the day of the lectures, Farris invited himself to the post-lecture discussion panels, where he asked obnoxious and uncharitable questions and famously accused St. Augustine of heresy. According to his simplistic way of thinking, if St. Augustine was a heretic, then nothing he said could possibly be worthwhile. He claimed he was only using his “academic freedom” to join in the campus debate. I don’t think it ever occurred to him that academic freedom is for people who don’t have power, not for those who do. Furthermore, his ignorant assertions were, again, publicly corrected by both students and professors. Embarrassed once more, he threatened Dr. Bates’ job and demanded the faculty put an end to the Faith and Reasons lectures (they refused). Shortly after this, the Academic Dean resigned to take a position in the Bush administration. I forwarded the email announcement to my dad and told him to watch and see if more faculty didn’t resign soon after. With the departure of this Academic Dean, the faculty suddenly felt exposed and unprotected. The events at the beginning of the semester had really drawn Farris’ ire, but in addition to this, they were increasingly targeted by Paul Wilson. In accordance with his trenchant anti-intellectual streak, Wilson had decided that the faculty were the ones responsible for fomenting “rebellion” in the student body, and he was determined to do something about it. I have a great respect for Dean Wilson and the RA’s who uphold morality and dignity even when others think it is extreme. The rules put in place have greatly increased my respect for the school as a whole and I’m proud to be called a student here. Let’s be careful in our mockery of the rules or just plain complaining and rebellion. Rightness trumps reasonability. Do what is right whether you think it is reasonable or not. How much do you love God? Enough to obey authority? In addition, Dean Wilson enlisted his RA’s and favorite students to help him target and punish students on his “bad” list, and to keep an eye on the faculty as well. They started monitoring the discussions in the classes of certain professors, and would go immediately to Dean Wilson’s office after class to report what they had heard. As the student body became aware of these practices, students became more and more hesitant to speak up in class, lest something they said be used against them. The professors were more audacious, and started mocking Wilson publicly. This was encouraging to students, but only increased the tension between the faculty and administration, and each side’s favorite students. One professor, Dr. Erik Root, was especially outspoken. He was personally offended that Dean Wilson would so overstep the bounds of his authority and intrude, even via proxy, into the classroom. The situation was bad enough by about the midpoint of the semester that a group of students, encouraged by some senior administration officials and a couple of Trustees, decided to do something about it. Many of these students were younger and still optimistic about what could be accomplished, especially now that we apparently had the ear of the Board of Trustees. I helped organize the little movement, but I saw it as essentially a last-ditch effort. First, we pointed out that the school lacked any official system of due process with regard to alleged rule violations. Students were accused, convicted, and punished without any kind of transparent process, without any chance to defend themselves, and without knowing the evidence against them. Furthermore, students were routinely punished for violating “rules” not actually enumerated in the handbook, and lived in fear of arbitrary enforcement. Secondly, we described what we saw as a culture of suspicion on campus, reinforced by the new rule requiring students to report each other or face equal punishment. Again, we emphasized that this culture of suspicion was exacerbated by the fact that students were maligned or punished for behavior that broke no specific rule at all—things like perceived attitudes, offhand comments, or unorthodox opinions. Thirdly, we pointed out that free thought and free speech on campus with regard to student rules or administration policy, no matter how innocent or well-intentioned, was treated as thought crime. Students who submitted without question were held up as moral exemplars, while students who asked questions or voiced opinions—even if they still obeyed!—were denigrated as rebels and troublemakers. Finally, we argued that these three factors combined to have a chilling effect on the classroom. Students were afraid to speak up in class, lest they share an opinion, or even just raise an uncomfortable point, that might land them on the “black list.” Professors worried about their ability to teach the liberal arts to students who were indoctrinated into an illiberal, submissive-to-authority mindset. We concluded that the college was engaging in self-defeating behavior. The Office of Student Life believed its mission was to create a culture of submissive conformists, while the faculty believed their mission was to create free thinkers who could lead the nation and shape the culture. The college was at war with itself. Even with the tacit approval and encouragement of higher-ups, we had a hard time gathering student signatures for the letter. Many students, especially those employed by the college, privately professed their support, but were too scared to actually sign the letter. Others promised to sign, but backed out at the last minute. [Name redacted] called me this morning and backed out of the whole thing. Not just the delegation – she doesn’t want any part in the whole project. Because I had put her name on the delegation email to Dr. Farris, she felt the need to email him and Dean Wilson and tell them she was backing out. I had already told her by email that it was okay if she didn’t want to be on the delegation, we could replace her with someone else, but apparently she got really scared while she was home and wants to make it extremely clear to everyone that she is no longer a part of this. I know this is probably bad, but she called me right after I woke up and I couldn’t think of a reason to tell her not to do this. I did talk her out of copying her email to all-students. We ended up with about 75 signatures, or one-third of the student body. A smaller delegation of students took the letter to Farris. The meeting was somewhat productive. Farris promised to create a committee to review student life rules and processes, and wrote an op-ed in the student paper reiterating his commitment to freedom of speech. The younger signatories were encouraged. I was not convinced, but I was glad we had done something. As we found out the following semester, our letter was nothing more than a doomed last-ditch effort. Once again, Farris’ “commitment to free speech” was only for appearance’s sake. He just couldn’t refrain from taking action against speech he disagreed with. I want you to know how much I appreciate you sharing this part of PHC history. I was a student at PHC from 2004-2006, so I was there during the crisis spring semester of 2006 (after which I left) and the semesters leading up to it. I honestly cannot recall if I signed your letter, but I remember being in support of it. It’s interesting to hear this story from this perspective. I’m sure its how it felt. As a student who was very much on the other side of this “war,” we felt persecuted and hated as well. We were afraid of these professors knocking us in class because we didn’t agree with them. We were treated like scum by these “enlightened” upper classmen who considered themselves the smartest people at the school. It was a terrible time for everyone. Another Witness — I’m curious what you mean by “knock[ed]” by a professor in class. What form(s) did you fear that would take? And did it ever happen? If so, to you or to others? Also, could you elaborate on being treated “like scum” by upper classmen? How did that manifest itself? One minor quibble: The above claim is inaccurate. The first edition of the rule book had this stipulation, and I believe all proceeding rule books did as well, so there was no “overhaul” of this sort. The policy was finally changed midway through the academic year via an administration email sent either in November or December 2005. The email nullified the rules on reporting, and at least for the spring of 2006, there were no rules requiring one to turn in offenders if one wasn’t an RA or RD. I can’t speak to the rules after the spring of 2006. Anything not-the-Bible is “the Enemy’s playbook”?!!! 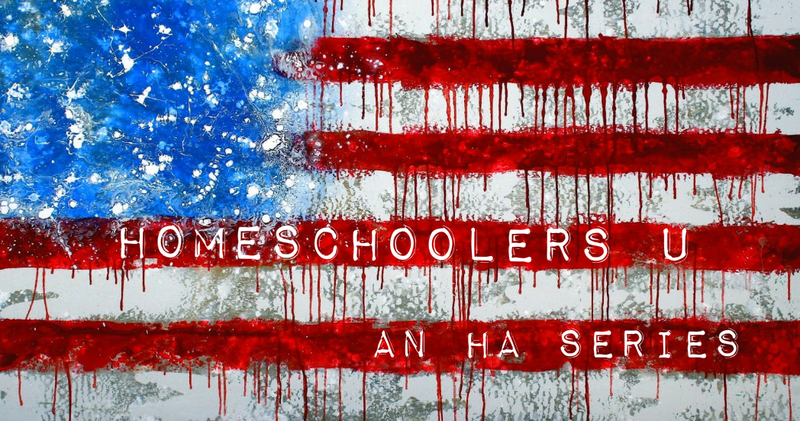 Of course notallhomeschoolersarelikethat… but apparently the guy who’s the face of homeschooling in America… IS. I have been wondering what actually happened in 2006 for about a decade. Thanks for this explanation. You will not see me much online because of my own lack of boundaries and because my ex still has joint legal custody of our son — and now I have two lawyers in two states — long story, but interestingly, most of my truly harmful experiences that resulted from ideology learned while being home schooled happened to me after I got married. Suffice it to say that I wish someone had told me to call the police when threatened with violence.